Die Kontroverse um Hannah Arendts Buch "Eichmann in Jerusalem"
Hannah Arendt's portrayal of the terrible consequences of blind obedience, "Eichmann in Jerusalem: A Report on the Banality of Evil" contains an introduction by Amos Elon in "Penguin Classics". Sparking a flurry of heated debate, Hannah Arendt's authoritative and stunning report on the trial of German Nazi SS leader Adolf Eichmann first appeared as a series of articles in "The New Yorker" in 1963. 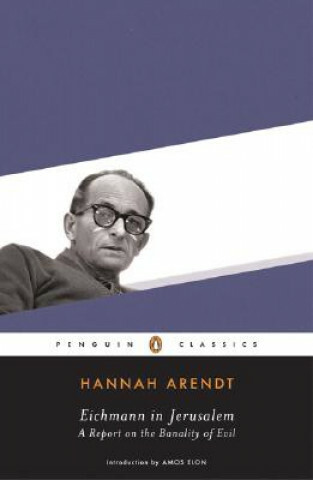 This revised edition includes material that came to light after the trial, as well as Arendt's postscript commenting on the controversy that arose over her book. A major journalistic triumph by an intellectual of singular influence, "Eichmann in Jerusalem" is as shocking as it is informative - a meticulous and unflinching look at one of the most unsettling (and unsettled) issues of the twentieth century. Hannah Arendt (1906-1975) was for many years University Professor of Political Philosophy in the Graduate Faculty of the New School for Social Research and a Visiting Fellow of the Committee on Social Thought at the University of Chicago. She is also the author of "Eichmann in Jerusalem", "On Revolution", and "Between Past and Future". If you enjoyed "Eichmann in Jerusalem", you might like Elie Wiesel's "Night", available in "Penguin Modern Classics". "Deals with the greatest problem of our time ...the problem of the human being within a modern totalitarian system". (Bruno Bettelheim, "The New Republic"). "A profound and documented analysis...Bound to stir our minds and trouble our consciences". ("Chicago Tribune").